What is Vapor Steam Cleaning? What Vapor Steam Cleaners do you recommend or rate? What is ‘Dry’ Steam Vapor steaming and how does it differ from the steam cleaners I have seen around? How does vapor steam cleaning work? What are the specific applications for a Vapor Steam Cleaning? What tasks can I use a Vapor Steam Cleaner for? Are chemicals used in the Vapor Steam Cleaning process? I want to clean carpets- What are my options? How much pressure does a Vapor Steam Cleaner generate? Where does the water of a Vapor Steam Cleaner go? What is the improvement over just scrubbing away with abrasives, soap or other cleaners? What about Chemical Sensitivities? Does Vapor Steam Cleaning Help? I have allergies to dust mites and molds. Why is Vapor Steam Cleaning helpful? Are Vapor Steam Cleaners used commercially ? I hear Vapor Steam Cleaning originated in Europe? What are the features that I can look for to distinguish between Vapor Steam Cleaning Models? There are a number of different vapor steam models available on your site. How do I know which is the right one for me? Why do some vapor steam cleaners cost more than others? Where can I find more details about particular vapor steam products? A. 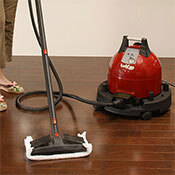 A vapor steam cleaner is often shaped like a vacuum cleaner but there the resemblance ends. Vapor steam is a revolutionary new cleaning system from Italy that uses true steam, usually 240 to 260 degrees Fahrenheit in good residential machines. Vapor steam cleaning sanitizes, deep cleans and deodorizes in one easy operation without the use of chemicals. For allergy sufferers, the heat of the steam penetrates the pores of the material being cleaned and instantly kills dust mites, viruses, molds, fungi, fleas and eggs. The benefits in improved indoor air quality are immediately obvious. Vapor steam cleaning can be used for a wide variety of difficult cleaning tasks. Only tap water is used in vapor steam cleaning. No chemicals are used in the vapor steam cleaning process, making it the most ecologically friendly ,as well as the most effective cleaning system. Q. What Vapor Steam Cleaners do you recommend or rate? A. For a concise and honest view of Vapor Steam Cleaners, see our Shopper’s Comparison. A. A vapor steam cleaner uses remarkably little water, only less than a gallon of tap water in an hour’s worth of continuous cleaning. All vapor steam cleaners use a low moisture vapor which leaves almost no damp residue. For instance, a carpet will be completely dry in 15 minutes, leaving no possibility for mold spores to proliferate from a damp environment. The heat of the vapor steam, plus a little light rubbing does all the work. Moisture evaporates immediately after the vapor steam makes contact with a surface. Surfaces cleaned can be hard [like counter tops] or soft like upholstery]. No buckets, mops, sponges or emptying out dirty water are needed. This is an almost ‘mess free’ way of cleaning. We say ‘almost’ because we have found in our testing of machines and dislodging dirt from baked-on or ground-in areas, that naturally, you need to wipe up the dislodged dirt particles with a towel on hard surfaces or vacuum a carpet subsequent to vapor cleaning. We stress that a vapor steam cleaner is NOT a vacuum cleaner. Q. What is ‘Dry’ Steam Vapor steaming and how does it differ from the steam cleaners I have seen around? A. Dry vapor steam cleaning machines produce both a high temperature, and a low moisture vapor. The vapor steam contains only 5% to 6% water, less moisture than in the air we breathe. Many products that are being sold as ‘steam cleaners’ in fact use no steam at all- they only use hot water. The term ‘steam machine’ is a complete misnomer. The ‘steam machines’ use gallons of water and leaving a wet residue on the surfaces they clean. Usually, carpets are left sopping wet, needing hours to dry off, an instant invitation and breeding ground for dust mites and mold. Vapor steam cleaning systems operate completely differently. They use a fraction of the water to produce thousands of gallons of dry steam per hour. A multipurpose vapor steam cleaner has a variety of tools to enable you to accomplish a wide variety of tasks around the house. Q. For what tasks can I use a vapor steam cleaner? A. There are a few surfaces to avoid which are very heat sensitive which include some silks, velours and the paint-work of your car. It may also take the shine off some [not all] vinyl flooring. Otherwise, the list of tasks that may be tackled by vapor steam cleaning is a long one. Each multipurpose vapor steam cleaner comes with an array of special tools which are specially designed to tackle some major cleaning headaches. Our list includes some cleaning problems you might have given up on. It is the fastest and most environmentally safe cleaning system you will have ever used. Killing of dust mites in bedding, upholstery, carpets, clothing. Dust mites, fleas and eggs are killed without the use of any chemicals or residue. Helps kill germs, viruses. Killing of mold spores in bathrooms, basements, window encasements, other damp areas where mold spores flourish. Steam cleaning of clothes to get rid of toxic dry cleaning fluids and wrinkles. Some vapor steam cleaners come with an optimal steam iron – a quantum improvement over a traditional iron. Disinfects and cleans cat litter box areas. Instant deep cleaning and sanitation. Detail car interiors – upholstery, carpet, infant seats, engine wheels [do not use on body work, it is too hot]. You can also degrease the car engine, car tools without solvents or toxic fumes. Brake dust can also be removed from car wheels. Vinyl tile, marble tile, smooth concrete, quarry tile for dirt and wax removal and grout cleaning. It is in the grout cleaning, both on the floor and in the bathroom where you should notice the most improvements. Carpets. You must vacuum and pre-spot here. Natural solvents, stain agents for bad stains are still useful in pretreatment of carpets with stains and heavy soiling. Vapor steam alone will not remove all the stains. You still need a surfactant of some kind. Vacuum again after using the vapor steam cleaner, to vacuum up additional dirt which has been loosened up during the vapor steam cleaning process. Do not vacuum until the carpet is dry, otherwise it will rust out your regular vacuum cleaner. Cleaning of soiled paint-work, [do not over heat and use a thick towel on these surfaces.] We think this is particularly useful in washing down a large area of grimy wall. Vents, ductwork entries, which often accumulate tremendous dirt. Sliding glass door floor sliders for French windows. The baked on grime and grease of stove tops and oven hoods and interiors. The cleaning and interior of microwaves. The accumulated hardened spilled foods and mildew at the bottom of refrigerators. The dust, grime, and pet hair, on the underside of your refrigerator. Grimy bottoms of household pots and pans. Bar-B-Q grill cleaning. Using a wire brush and steam you can actually clean the grill rack. Hospitals who are concerned with maintaining a clean germ and virus free environment. Bathroom and kitchen Sinks, faucets. Using a wire brush attachment, grout surrounding sinks is cleaned in a way that is a dramatic improvement. The amount of dirt that is removed is quite enlightening! Cleaning of bathroom tiles, floors, bath surrounds, toilet interiors, shower curtains, shower stall doors. All the areas of the bathroom which harbor bacteria, germs, viruses, mold and odors. Your bathroom will smell fresh and be completely sanitized. Metal venetian blind cleaning. Steam and wipe. Freshen up and sanitize children’s stuffed animals. Sanitation of the children’s nursery. Q. I want to clean carpets- What are my options? A. Let us compare traditional steam machines to vapor steam cleaning the ‘steam cleaners’, you may be familiar with or seen used by a rug cleaning service .They are all based on water extraction. The ones that are truck mounted can cost up to a small fortune. Home based systems are only a few hundred dollars and their performance usually equals their price. Low Price equals low performance. These water extraction units do not use steam, they pump large amounts of water through jets accompanied by chemicals onto your carpet. They provide some kind of brushing action and then ‘extract’ most of the water and chemicals out of your carpet. The disadvantages of these lower end water extraction systems, and indeed some of the more expensive ones, is that the soap and chemical residue is both harmful to the carpet and your health. Damp carpet is a breeding ground for mold and dust mites. However, extraction units have been traditionally the most efficient way to cover a large area of dirty carpeting. Results are often indifferent, producing streaking and a great deal of dirt left behind which has only redistributed. This is why your carpet seems to get dirty again so quickly. 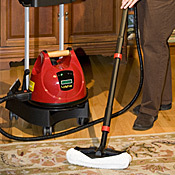 In using a vapor steam cleaner to CLEAN your heavily soiled carpet[as opposed to killing dust mites in your carpets for which it is superbly well qualified], you should first vacuum up all loose dirt[you do this with an extraction unit too].You then should pre-treat the area, by spraying on some natural ecologically surfactant. Vapor steam alone will not take out all the stains. Then you should use a good quality vapor steam cleaner [the lower priced ones will simply not up to the task] over the carpeted area and gently rub with the toweling applicator to absorb dirt. The last part of the process is to vacuum over the carpeted area which will now have the carpet fibers opened up by the heat and more accessible for vacuuming. You should leave it to dry for a few minutes[15 to 20] before using a hepa vacuum cleaner to collect dead dust mites and extra loose dirt. This method while tedious will give you the best results. We see the Ladybug and VaporJet steam cleaners as being adequate for cleaning carpets. 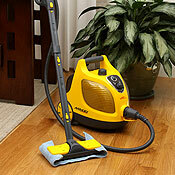 Recent product advances now give you some additional options of combining vacuuming and vapor steam cleaning. A dream come true you might thin k- well almost, but not quite. A couple of potential drawbacks for allergy sufferers in particular. These machines originated in Europe where with 220 voltage you can vapor steam and vacuum in one concurrent operation. Then subsequent extraction of moisture is always a separate stage. In order to convert these machines for the American electrical voltage, the vapor steam and vacuuming are now two separate but sequential tasks even though housed in the same machine. This means you switch back and forth from vacuuming to vapor steam cleaning. In doing so, your vapor steam cools down. So if you are not careful you could be only using hot water not steam, if you do not wait for the steam to heat up again. You also have to remember that water based vacuuming is not hepa based and does not use a power brush [a regular power brush would rust out], so the vacuuming power is somewhat limited. The lack of a HEPA filter, not suitable for a wet vacuum, is a disadvantage for the allergy sufferer – not important of course if you do not suffer from allergies. Because this vacuuming system is water based, it has all the same disadvantages as traditionally associated with a Rainbow System except the Rainbow system is vacuuming up dry particulates into its water well. In our talks with vacuum cleaning stores we heard frequent reports that Rainbows have a poor repair record because they rust out. Independent research has indicated that not all the particulates get trapped by the water well but in fact blow out the other end of the machine, recontaminating the air. A. No chemicals are used in vapor steam cleaning. We do need to stress that we still advise using a natural surfactant on heavily soiled and stained areas, and we include some carpets, bathrooms in our list. Our testing of residential vapor steam cleaners showed us that you will find steam alone will not be sufficient for these kinds of cleaning challenges. However, you will be pleasantly surprised at the variety of tasks for which steam is not only adequate but far surpasses regular cleaning. A. The water is put into a special boiler. The better grade vapor steam cleaning systems allow for continuous refill of water without allowing the system to cool down between fills. The less expensive vapor steam systems have a heat sensitive safety cap which do not allow you to refill the system until it has cooled down. These boilers fast heat the water and it is discharged as ‘dry steam’ which contains 6% water. This way carpets and floors dry quickly with little moist residue and are fully dry in a matter of minutes. A. Surprisingly, vapor steam cleaners operate at low pressures usually 50 to 60 psi. The better machines allow you to vary the pressure and regulate the steam, as more delicate tasks need less pressure. The low pressure is important to get the job done without making a mess and spraying particulates all over the place. This was a big criticism we had of cheaper units – they seemed to create as much mess as they cleaned. A. Vapor steam is faster, cleaner and more effective than regular cleaning methods. Dirt is loosened up really fast and the dry steam penetrates the pores of surfaces. We never saw our kitchen countertops so clean as when using one of these cleaners. Vapor steam cleaning appeals to those who want to get their house REALLY clean. It is also a natural sanitizer, great around pet and nursery areas. Vapor steam cleaning is a cleaning process that does not leave a residual from a cleaning fluid, so surfaces are left cleaner. Q. Where does the dirt go? A. This depends on the task at hand. During carpet or floor cleaning, a removable towel is used on the end of an applicator. This absorbs a great deal of surface dirt. Other surfaces need wiping with an absorbent towel or cloth. A. The all pervasive dust mite lives in our mattresses, blankets, pillows, upholstered furniture, carpets and even clothing. The usual method of getting rid of dust mites is to wash all bedding once weekly in hot water over 140 degrees. Very few allergy sufferers adhere to this regimen and end sleeping with dust mite infected bedding. Other areas are even more difficult to control with costly sprays and powders which need frequent application. The heat of the vapor steam cleaner kills the dust mites on contact. Just run the cleaner over your bedding, carpets or chairs and dust mites are killed instantly with no wet residue. However, after you have used the vapor steam cleaner, you should use a good HEPA vacuum to vacuum up any dirt particles left behind. There is no toxic residue after vapor steaming, which is healthy for everyone including pets and children. A. It is the treatment of choice for MCS sufferers. It is the only cleaning system that is really effective without the use of chemicals. Vapor steam is naturally sanitizing while cleaning and removes odors. No MCS sufferer should be without one. Even if you do not suffer from multiple chemical sensitivities you will appreciate a cleaner smelling house. A. It originated in Italy by manufacturers of Expresso coffee machines. It has been used in Europe successfully for 15 years but only recently has been introduced to North Amercia. Vapor Steam Cleaning products needed to be adapted to our electrical system and meet American and Underwriters Laboratories safety standards. A. Very much so and we are pleased to offer a variety of Commercial Steam Cleaners that fit the needs for nursing homes, hospitals, stores, commercial kitchens, offices, schools and clean room facilities. A. The models vary with the number and type of accessories, their tank capacity, and a variety of control features. In general, we see people as being more satisfied with the higher end multi purpose models. We do include some lower end machines on our site such as the Vapamore or Sienna vapor steam cleaners. We have written some pretty candid reviews for you to contrast and compare with higher priced machines. If you want a lightweight, hygenic, easy to use alternative to your home kitchen and bathroom mop, an Vapamore may be all you need. But you would not buy an Vapamore for cleaning a restaurant kitchen floor. Also please be aware that there are good reasons why the higher priced vapor steam machines cost more, they work work better – there is not doubt about that. You should be aware that higher priced machines deliver steam at a higher temperature. Please do not use residential machines for commercial uses. Commercial vapor steam machines are more rugged and long lasting, this is one of the reasons they cost more apart from performance issues. For a concise and honest view of Vapor Steam Cleaners, see our Shopper’s Comparison. Ability to regulate the steam outflow with pressostat. Low pressure systems are better than high pressure system. Length of warranty on boiler and other parts. It is usually 3 years on a good residential machine and 5 years on a commercial machine. Good handle for easy lifting up stairs. Weight of the machine [filled with water]. Needs to be light enough for easy maneuverability in a residential multi- floor environment. Length of the power cord for continuous cleaning without moving the machine [and cooling down the vapor steam]. A. Check out our Vapor Steam Cleaners section You will find a wide selection of machines accompanied by reviews and ratings. Just a note of caution. We recommend the Ladybug and other machines. 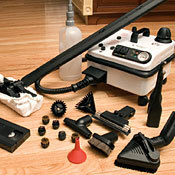 Also, for a concise and honest view of Vapor Steam Cleaners, see our Shopper’s Comparison. Q. Why do some vapor steam cleaners cost more than others? Actual temperature of the steam. Residential units generally use steam between 240 and 295 degrees. Avoid anything of lesser temperature. Hotter steam means a quantum increase in cleaning effectiveness. What’s more it is necessary to start with a much higher temperature than you would think you might need, as all vapor steam cleaners lose some temperature on the way to the tip. The very best machines have boilers made out of stainless steel which heat up faster, and do not rust. Cheap machines have no safety caps when refilling water, versus safety caps. The ability to refill water continuously is more important than you might think. If you have a continuous refill machine you do not have to wait for the machine to cool down and heat up again when you want to refill it[this can be a 20 plus minute wait].It also means that the machine is lighter as you are not lugging around all that water. Holding water tank capacity. Very small water tanks can drive you crazy when you have to refill them every 15 to 20 minutes. Having the ability to regulate the steam outflow with pressostat is important. Some tasks require a finer more concentrated jet of steam. This can be important when you want to avoid the splattering of dirt particulates all over the place. Ability to regulate the steam temperature. Some fabrics and surfaces require a cooler temperature. Good handle for easy lifting up stairs. Somebody needs to have really paid attention to this design feature. Decent sized castors allow for easy maneuverability. The accessories included for special cleaning tasks, and optional accessories available add to the cost of the machines. Size of the cleaning brushes is also an added expense. The better machines have bigger sized tools which allow for the cleaning to be done faster. Quality of toweling covers and whether they can be attached and removed easily makes a difference. The better machines have easy clips to attach the toweling covers.